A second Canadian company has had its licence to sell canola to China revoked as a crackdown continues on one of the most Canadian crops in the world. The latest move involves Regina-based Viterra Inc., Reuters and Bloomberg reported Tuesday. The company, formed out of the merger of the former farming collective Saskatchewan Wheat Pool, is a major handler of canola. Canadian company Richardson International was hit by a similar ban earlier this month when the Chinese government declared it had found dangerous pests such as fungus in the company’s canola, so it halted all shipments. Last week, the Canola Council of Canada announced orders from China had mysteriously dried up across a number of canola sellers. China’s ban of Viterra is effective immediately. In justifying the move, Chinese customs officials said the ports of Dalian and Nanning had detected the same pests in Viterra’s canola. The company did not immediately respond to a request for comment by CBC News. The unexpected canola conflagration comes against the backdrop of a roiling diplomatic dispute between the two countries, seemingly sparked by the arrest of Huawei executive Meng Wanzhou in Vancouver last year, at the request of American authorities. China has strongly objected to Meng’s arrest, and ratcheted up pressure on Canada to undo that move. The country has detained two Canadian businessmen alleging espionage, and now seems to be picking a fight over canola — a crop literally named after Canada. Canola is a type of rapeseed that has a distinctive yellow flower and was invented by Canadian researchers in the 1970s. The seeds can be crushed into an edible oil, and discarded husks also make for an excellent animal feed. 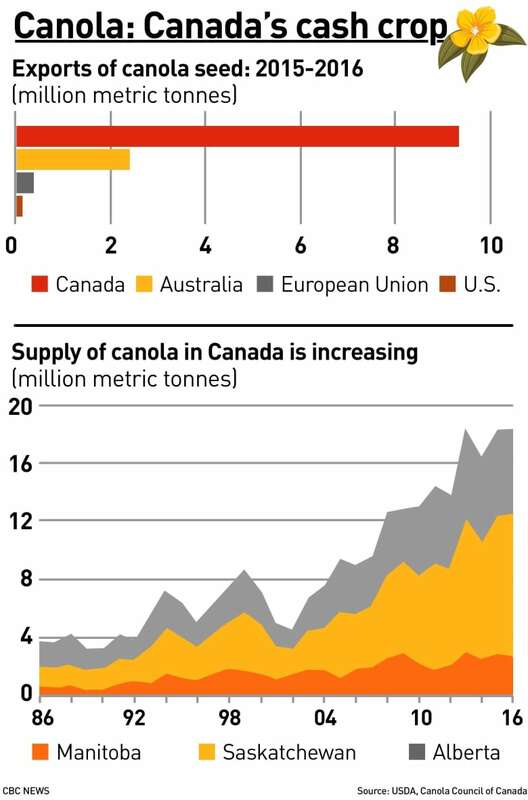 Canada exports more canola than anyone else in the world. Last year, about 40 per cent of its seed exports went to China, worth roughly $2.7 billion.